Yuzu is a yellow citrus, which tastes sort of like a mix of grapefruit and lime. It is in season and you see them a lot at a local Japanese grocery store now. Using yuzu zest and juice, I fixed a quick daikon radish pickles. It tastes the best the following day. Peel daikon and carrot slice thinly with a mandolin and cut into half-moon or julienne. 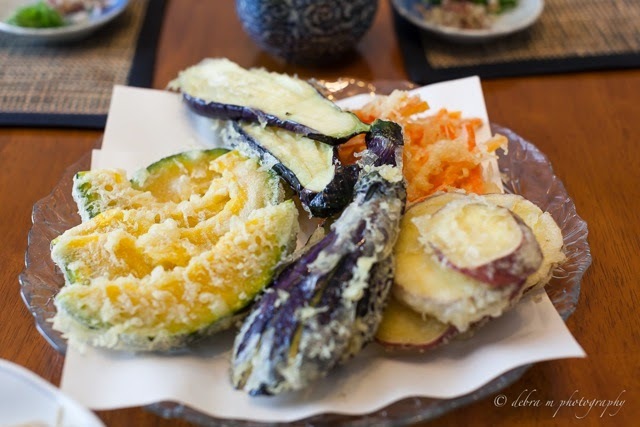 Place the daikon and carrot in a container and add all the rest of the ingredients. Massage vegetables gently and refrigerate for at least two hours before serving. Soba workshop was held at a soba restaurant called Choju-an Watanabe (長寿庵　渡邊) in Minami Aoyama, Tokyo. The owner of the restaurant, Mr. Watanabe, was kind enough to show us his soba making tricks. He also prepared us a special lunch including juicy rolled egg, soba dumpling in duck soup, and of course soba noodle. It was very fascinating to see how soba noodles are made and it was a fabulous way to spend our saturday morning. If you have a chance to go to his restaurant, I highly recommend to try this soba noodle restaurant for its duck soup! This is a very simple way to enjoy green vegetable. In this photo, I used "Nano-Hana" (field mustard) which has mustard taste as the name suggests. You can also use spinach, broccoli, kale, and some other green leafy vegetable for this recipe. Also in stead of wasabi, you can try "yuzu koshou," which literally means yuzu citrus pepper. There are no pepper in this green wasabi like paste however, and it does taste more like wasabi with a hint of citrus. This is a must try item if you can find it. In a pot, boil about 6 cups of water. Turn the heat low or off and put the green vegetable in to the pot to welt them. We are not really cooking the vegetables in the boiling water, so turn the heat off if you have not done so at this point. Once the vegetables are softened, cut them into a bite size. Mix soy sauce and wasabi together and pour onto the green. Serve warm or cold. 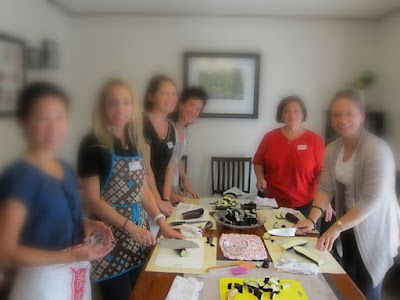 Our Japanese Home Cooking Class is held in Roppongi 5-chome not too far from Nissin. The classes are always filled with wonderful ladies from around the world. I highly recommend taking the Japanese Cooking 101 class, which is the most popular class, to gain a basic knowledge of the Japanese cooking. The class will also help you with your next shopping experience at a local grocery store as we go through some of the pantry items. By using a rice cooker, this dish can be prepared ahead easily. Wash the rice and set your rice cooker to “regular” or “normal.” Take any remaining bones out of the fish and cut it into small pieces (about 5 x 5 cm or 2" x 2”). Add the fish, kelp, ginger (julienned), soy sauce, mirin, and sake to the rice. Add water to fill up to the level 2 line (as we are cooking 2 cups of rice) and cook the rice. When the rice is cooked, discard the kelp. Serve the rice with shiso leaves and sprinkle of sesame. You may also add pickled plum (umeboshi/うめぼし) to the cooked rice. Teriyaki sauce can be applied to many other dishes, so keeping the teriyaki sauce recipe is very handy. Marinate the fish with 2 tablespoons of sake and 1 tablespoon of soy sauce for about 10 minuets. In a medium sized bowl, mix all the ingredients for the teriyaki sauce. In a large frying pan, heat the oil and place fillets. Fry the fish for about 1 minuet on each side (just enough to see its color started to brown), add the teriyaki sauce into the pan. Simmer on low heat while pouring the sauce in a pan over the fish. Once the sauce become syrupy take the fish out (for about 8-10 minuets). I also teach western cooking especially useful for the holidays and occasions, including brunch, cocktail party, Easter, Thanksgiving, Christmas, and more. After having lived in the USA and Europe for the last 15 years, I moved back to Tokyo due to my husband's work assignment in Japan. Recently we moved again to Hong Kong.